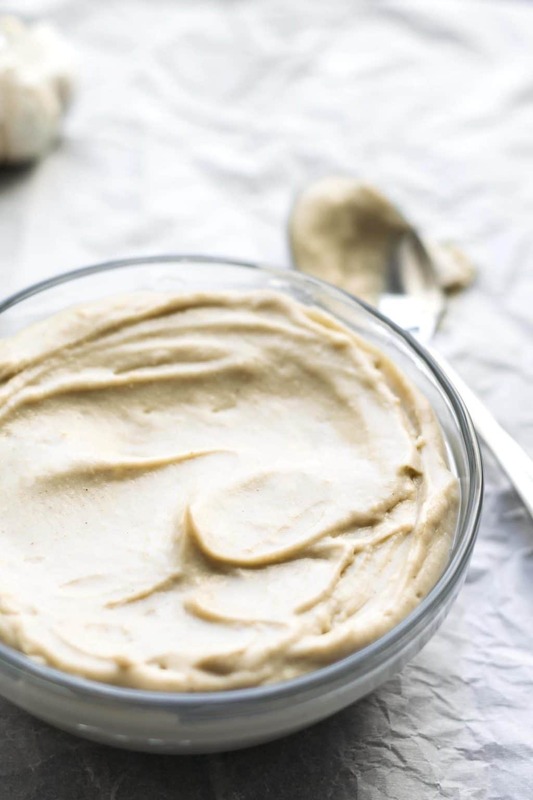 Beyond being a delicious creamy base for your pizza toppings, it’s perfect when tossed in pasta, slathered on bread for a sandwich, or thinned slightly and drizzled as a dressing for a bowl. Let your imagination and your taste buds run wild! This white sauce whips up in no time! Cashews blend with a healthy shot of garlic, salt, nutritional yeast, and water for a creamy, garlicky, savory milk. The sauce is then thickened using a roux, similar to how you’d make a béchamel. A roux is simply flour (or starch) cooked in fat (both vegan butter and oil work!) and it’s used to thicken liquids. 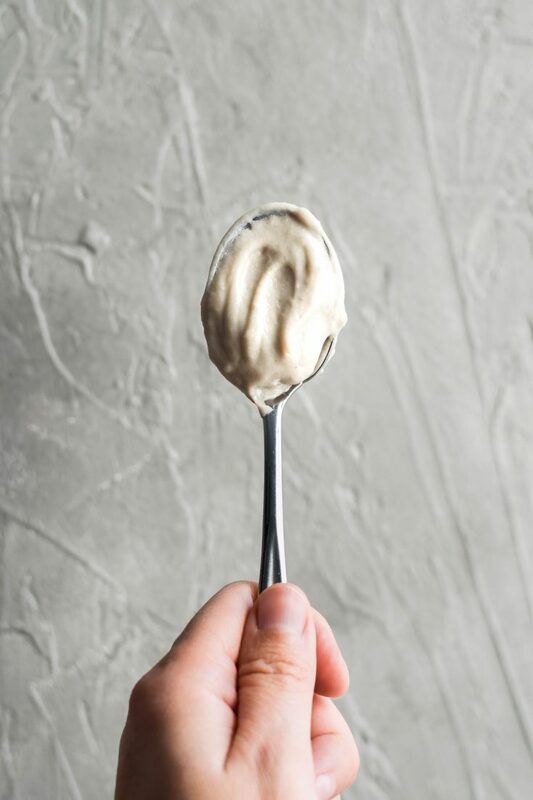 It gives the sauce a more traditional texture than just using a higher cashew:water ratio, as this is exactly how the original dairy-based versions are made. Cashews are often the nut of choice because they blend up ultra smooth, especially when you have a high powered blender, with no need to strain the milk. If you just have an average blender soaking the cashews beforehand helps. You can either soak the cashews in cold water for 2 hours (or up to 24h in the fridge) or 30 minutes in boiling hot water. The natural starches in nuts also thicken a bit when heated, assisting the flour in creating a thick cream. I find that 3 cloves of garlic gives this sauce a nice garlicky flavor without being too overpowering. You can always add more garlic if you’re not a vampire a garlic fiend. Nutritional yeast acts as a substitute for parmesan in traditional dairy white sauces. It has a delectably cheesy and nutty flavor. Plus you get a bonus dose of vitamins (and that all important B-12–assuming you get the B-12 enriched nutritional yeast, and you should, so double check that)! Trust me, vitamins never tasted so good. Anyway, put in your requests for pizzas involving white sauce! Because I’m ready to make them and eat them and share them with you guys! And let me know how you use this vegan garlic white sauce. It’s so quick and easy to whip up so I really hope you do! 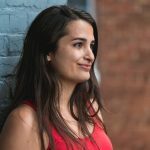 Check the notes below for substitutions for dietary restrictions (note: the coconut milk version works well for blender restrictions as well) and as always let me know if you have any questions! As always, don’t forget to tag your recreations @thecuriouschickpea and #thecuriouschickpea on Instagram, or share with me on Facebook! Happy Creating! To make gluten free: use arrowroot, tapioca starch, or a gluten free flour blend instead of the all purpose flour. Note: if you’re using starches don’t try to toast them, just cook for ~1 minute and continue. For a speckle-free sauce use white pepper instead of black pepper. For a nut free version: substitute 2 cups coconut milk for both the cashews and water. 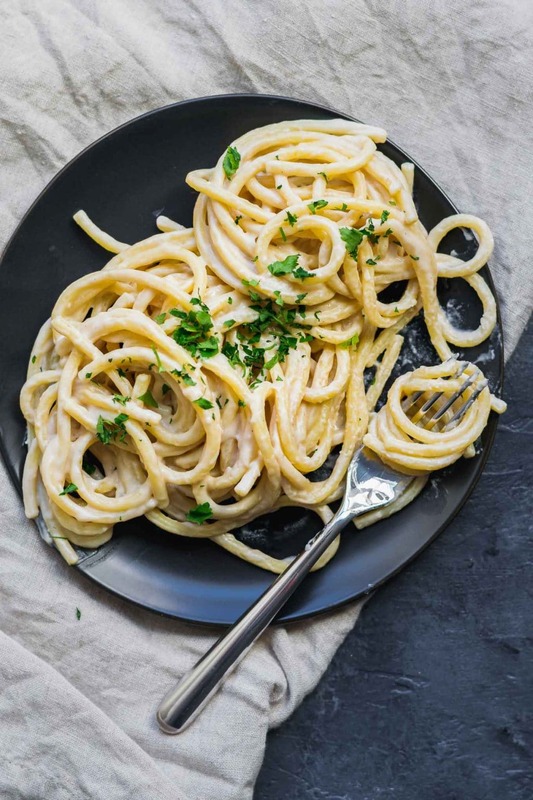 A creamy white sauce that's perfect as a base on pizza, as a sauce for pasta, or a dressing for a bowl-style meal, and more! 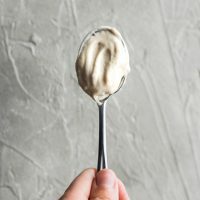 A cashew cream and roux-based vegan sauce. Add the cashews, garlic, water, salt, and nutritional yeast to a blender. Blend until smooth and creamy, scraping down as necessary. Heat a heavy bottomed pot over medium-low heat and add the butter. Let it melt then add the 3 tablespoons of flour. Stir to mix and let cook for 3-4 minutes until the flour is lightly toasted and a shade darker. Slowly stream in the garlic cream, whisking as you pour so it doesn't clump up. Add the black pepper and whisk while the cream comes to a simmer. Let simmer until thickened, about 3-5 minutes, then remove from heat. If the mixture remains a little clumpy, just use an immersion blender or an upright blender and blend to smooth. Store the garlic cream in the fridge for up to a week. Soak for 30m in boiling hot water, 2 hours (or longer, but in that case put it in the fridge) in cold water. If you have a high powered blender you can skip the soaking step. And sorry, that was an oversight to not explain! This looks great… but butter is not dairy free! I used oil instead. Do you know a good gluten free flour that would work well in this recipe? I like tapioca starch or arrowroot! Oat flour or any gluten free all purpose blend would work as well. How do you think this would freeze? If the full batch wasn’t going to be used within the week? Looks delicious ! Can another nut be used to substitute the cashews if I don’t use coconut milk ? Hi Tricia, you can use almonds (choose slivered blanched almonds or pop the skins off whole ones after soaking) or macadamia nuts, though they won’t get as smooth as cashews do. Take care to soak them in water for a few hours before using. For nut free sunflower seeds are popular but I haven’t tried them myself in this recipe. Hi. Love your website and the recipient look amazing! Are you able to convert them to grams as I am always unsure if the conversions. Hi Sean, I do try to include weights on recipes that are more finicky, like baking (breads and desserts). I will try to be more consistent about it in my other recipes. I do use the standard United States measurements, which can be found here: https://en.wikipedia.org/wiki/Cup_(unit)#United_States. Sometimes it doesn’t really matter if you use for example the UK measuring system vs the US. It’s only a difference of 10mL between the US cup and UK cup, so when making a sauce it just doesn’t make a huge difference which you use! I’ve updated this recipe with the weights and hope that helps.